The German energy-storage player is planning to announce some big news this month. Last month, Tesla's head of operations in Germany, Philipp Schröder, left for competitor Sonnenbatterie to help lead that company's global expansion. And this month, Sonnenbatterie has picked up seven more leaders of Tesla's team in Germany. The exodus coincides with plans for a major announcement from Sonnenbatterie on November 25. Like Schröder, who is now Sonnenbatterie’s managing director, a number of the Tesla defectors are former Sonnenbatterie staff. Jonas Rabe, for example, has rejoined Sonnenbatterie as marketing manager after being Tesla’s sole marketer in Germany. Previously, Rabe had led sales and public relations at Sonnenbatterie before moving to Tesla in March 2014. Another high-level defector, Alan Atzberger, has no history at Sonnenbatterie. Before handling Tesla’s sales and marketing, Atzberger worked for consumer brands such as Adidas and Quicksilver. He joined Sonnenbatterie this month as vice president of direct sales and marketing. In addition, Tesla’s former Frankfurt regional sales manager, Marcel Meub, has joined Sonnenbatterie as head of sales for Germany, Austria and Switzerland. Schröder, who pursued a career in green energy after growing up near a proposed nuclear-waste disposal site, told GTM the other ex-Tesla Sonnenbatterie recruits are “additional sales and operational staff,” including Tesla’s call center manager. The new arrivals, he said, are helping to execute a new strategy that will be rolled out this month. "We literally had to turn down applications, which underlines that our planned technology attracts top talent already," said Schröder. The team forming at Sonnenbatterie is largely the same as the one that helped Tesla outsell the Porsche Panamera and BMW 7 Series, even though sales in Germany have fallen short of Tesla’s own expectations. Sonnenbatterie has not divulged details of the November 25 announcement. While it is certainly some kind of competitive strike against Tesla’s European Powerwall launch, GTM now understands it is not related to battery pricing or hardware. “Many perceive my move as bold," said Schröder. "But my team and I believe the concept and technology we will present in Berlin will change the way we look at energy." “Elon [Musk] himself always states that real change needs people who will be perceived as bold because they try something that seems to be out of reach. I truly believe that we can make Sonnen more significant than anyone could anticipate today," said Schröder. 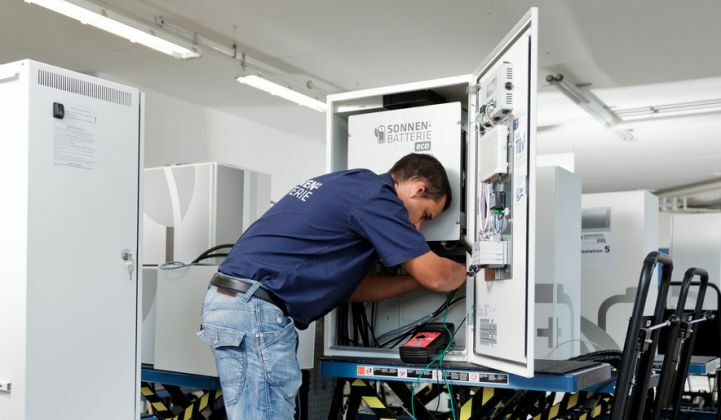 Sonnenbatterie, which was established in 2010, is currently one of the leading residential energy storage companies in Europe. It has installed more than 8,300 lithium-ion based battery systems in Germany alone, giving it around a 40 percent market share. In April, Sonnenbatterie announced a partnership with the leading U.S. solar installer Sungevity to offer solar-plus-storage systems across America and Europe. The Bavarian firm relies on Sony Fortelion lithium-ion batteries for its storage systems, claiming they can be used for up to 10,000 charge cycles. It also has a proprietary software system that ties together storage, PV and home energy management. This software system is known to support virtual power plant capabilities similar to those offered by LichtBlick, another German energy storage player. While the November launch appears to be mainly targeted at the German market, Sonnenbatterie has recently been making moves into other countries. In addition to its agreement with Sungevity, news emerged this month of a U.K. market launch in conjunction with Green Acorn, a Cornwall-based energy storage company. “We are actually the first and only company that already...operates intelligent PV and wind turbines plus storage in Asia, Australia, the U.S. and Europe -- unlike many other big names that announced much but delivered little yet,” said Schröder. Tesla did not respond to a request for information about its German operations, which are currently believed to be under the control of Jochen Rudat, the carmaker’s Switzerland country director.